Were you in Italy, Ami? You went back to Italy again, didn’t you?!?!?!? Don’t know where you went …. most seem to think Italy … but just wanted to let you know how much I enjoy reading your blog and newsletter, especially the parts by Madison. I get such a good laugh from all of it! Makes my day sparkle a bit. Also love what you do with AAQI. You are my hero!!! Someone sent me a joke that I thought was funny and serious at the same time. It talked about all the money that is being spent on Botox, implants, Cialias (and other such stuff), etc. but that as we get older, we would not remember what to do with all that this stuff is suppose to “enhance”. Funny, yes, but too bad we are not spending that money on research instead. Love what you do ….. keep it up. Yes, I did miss you. I thought Italy and it looks like most everyone else had the same idea. I’m thinking Olive Garden USA. LOL!! My guess was either some where in Italy or at the beach (on the shore). Since so many have already guessed Italy, I’ll go with the beach! Where ever it was I hope you enjoyed yourself thoroughly! 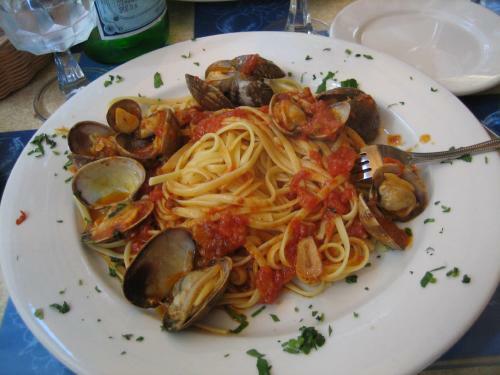 It looks like you were drinking Acqua San Pellegrino (Italian water), but here in Italy we usually have spaghetti – and not linguine – with clamshells. Somewhere that serves beautiful food! Hope it tasted as good! Ha! I was just wondering why I hadn’t received my Ami fix, and you arrived in my mailbox. Hope you had a lovely vacation, and I hope it was Italy because, well, you know how wonderful Italy is! But on the off chance you stayed close to home, I’ll guess you went to your favorite “local” Italian restaurant in Windsor, Onatrio (Canada). Boy, am I glad to know everything’s all right. I scoured your web-site last night–first to be sure my computer wasn’t on vacation, then to make sure everything was O.K. with you & Mom. Maybe, you could warn us next time? The farthest I would get to go is an Italian Restaurant. Houston, TX Lots of good seafood there! Well, there are sure a lot of Italy’s to split that small gift, if that’s where you went. I missed you, too. I hope you enjoyed your visit to Galveston Island, TX. You should have called! I’d guess Marseilles, France, or maybe San Francisco? My guess is Venice, Italy. However, to me, the picture of the Dutch Baby pancake at Walker Brothers restaurant was much more appealing. And, I did miss you–just thought you were very busy. Glad to know you were on vacation having fun. Don’t know where you went but the dinner sure looks good. Wish I had gone with you!! I think you went to Windsor, Ontario. Was it Toni and Biaggio’s La Calabrisella restaurant on Erie Street? Did you go to Italy? I hope it was Spain!!!! If not it had to be Marios (downtown Detroit). My first guess was New Orleans but someone already guessed that. Now I’m wondering if it was in New England, possible Boston. Give us a hint. Did Madison get to go too? Would it be NY City? Theres so many ethnic places to eat. Not sure where my China! comment went, but I’ll try again!